Renting designer handbags is a popular way to wear the latest accessory trends on a budget. Whether you opt for a minimalistic style from a label that's not widely known or want to make a true fashion statement with a big designer name, there are several places where you can find the latest arm candy straight from the runway. Bag Borrow Or Steal is a platform where you can either rent, buy, or sell bags. You can rent your chosen accessory in one-month periods. It will be shipped free of charge and arrive in a pristine condition as all rentals are cleaned professionally when they're returned. What happens when your rental is due? You will receive an email alert and then you merely return the bag for free. If your time is up and you want to keep the bag for longer, Bag Borrow Or Steal will renew the rental automatically. Bag Borrow Or Steal currently have around 30 designer brands in their portfolio, including big names like Chanel, Louis Vuitton, Prada, and Valentino. Rentals start at $45/month for a Michael Kors bag and go up to $600/month for a Chanel number. If you damage or lose a bag while it's under your care, you are responsible for the full retail price of the item, and it will be returned to you. Unacceptable damage includes stains on the interior and exterior (such as ink, makeup, or spills) and gouges on the exterior. Based in the US, Bag Romance is an online boutique for luxury handbag rental. Choose your rental from one of the many gorgeous handbags and follow the simple checkout process. You can reserve your new love for seven to 30 days, and it will be delivered to your door. Once your rental period is over, drop the bag off at UPS, and it will be returned and cleaned for free. Whether you're looking for a roomy everyday accessory or an elegant nighttime staple, Bag Romance offers something to fulfill every modern woman's needs. They feature top designers such as Gucci, Celine, and Alexander Wang. Rental prices vary from $90 for a 7-day Alexander Wang to $500 for a 30-day Chanel bag. Shipping will also set you back a flat-rate of $25, but it's free if you spend over $150. Bag Romance is pretty understanding when it comes to wear and tear. They accept that minor stains and damage might be inevitable and include free insurance with every bag. Significant damage and theft, however, aren't covered by the insurance. In these cases, you will have to pay the full retail price of the handbag plus applicable sales taxes. Rent the Runway is a fashion retailer that gives people access to remarkable luxury experiences. They offer clothing and accessories as well as handbag rentals. Find your perfect bag rental on either the Rent the Runway site or in one of the company's physical retail locations. Then, select a timeframe. You can rent your item for four or eight days before returning it free via a UPS or company store. Rent the Runway features over 300 designers and thousands of styles. Many of these designers aren't well known to the masses; however, they also feature big names like Missoni, Saint Laurent, and Balenciaga. The prices for bag rentals vary. The cheapest deal on the site currently is $10 for a 4-day Whiting & Davis rental; the most expensive is $640 for an 8-day Anya Hindmarch handbag. There is also a $5 charge added to each order as insurance. This covers minor damages and wear and tear. 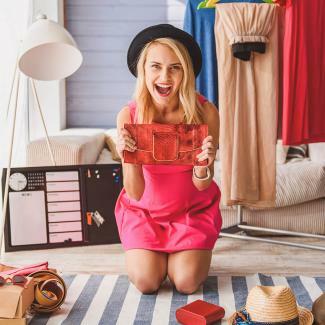 If you significantly damage your rental from Rent The Runway, you will be charged the full retail price of the item. If you lose the bag or it's stolen and never returned after its due date, you will be charged a late fee of $50 per day for 20 days to give you the chance to locate the bag. After the 20-day period is over, you will be charged up to 100 percent of the handbag's retail value plus applicable sales tax. Based in Denver, ArmGem is a bag rental service that "allows fabulous ladies the opportunity to be trendy without the expense." Once you've located your new bit of arm candy, use the checkout process and it will be shipped to you within six to eight business days. You can keep it for up to one month, but make sure you email the customer service team five days prior to your renewal date to request a return shipping label. ArmGem has a small but mighty collection of bag rentals, which includes designer brands such as Givenchy, Stella McCartney, and Burberry. Rental prices start from $50 per month for a Tory Burch and go up to $310 for a Prada bag. In terms of shipping, your order will be sent for free if you've spent over $100. Otherwise, you will be expected to pay a small shipping fee. The ArmGem terms and conditions state the company reserves the right to charge the customer if one of their handbags becomes damaged in the customer's care. The customer will have to cover the cost of repairs or, if the repairs don't restore the bag to its original condition, the Manufacturer's Suggested Retail Price (MSRP) will be charged. In addition, if a bag is lost or stolen, the customer will have to cover the MSRP price. There is a lot of argumentation for and against renting a handbag over buying one. You get to try out different handbag styles in a short period. You get to wear the latest seasonal styles for less money. If you decide you don't like a certain style, you can simply give it back once your rental period is over. However, the major downside is that you might fall in love with a specific handbag and not want to give it back! In this case, though, you can always decide to purchase the style for long-term use. It costs a lot of money to rent handbags repeatedly. If you accidentally damage the bag, you have to pay for it. The bag is never truly yours. The best way to decide what's best for you is to weigh up the pros and cons. Determine the bag's purpose - Short-time rental can be worth it if you want a new handbag style for a special occasion or to experiment with. Weigh the costs - If you really like a particular handbag, make sure that you weigh the costs of rental over the costs of retail. It might not even be worth renting it if you're considering buying it one day anyway. However, if you're really not sure, it can help you make the decision. Avoid long-term rental - It goes without saying that renting bags all the time would work out to be extremely expensive. However, occasional renting provides great opportunities for fashionistas on a budget. There are some foolproof ways you can protect handbag rentals from any damage or wear and tear. Utilize the protective packaging - Most handbag rentals are shipped to you in a fabric cover that's designed to keep it preserved. When you're not using the rental, simply pop it back into its packaging and store it in a safe place. Avoid wearing fabrics that might snag it - Sequins are often the big culprit! To keep your rental snag-free, make sure you avoid wearing it across your body or on your arm when your outfit is highly embellished or three-dimensional. Be careful with denim - Cheap colored denim can sometimes emit dye if it's rubbing against an object or other fabrics. If your handbag is a crossbody style, perhaps avoid wearing it with your bargain jeans from Walmart to prevent a disaster from occurring. Keep your eyes on it at all times - It may sound obvious but, if you're wearing your rental to a special occasion like a wedding or evening work event, never let it out of your sight! Even if you feel like heading off on the dance floor to show everybody your moves, take your handbag with you. This will eliminate the risk of something happening to it like it getting lost or stolen. Renting designer handbags is a straightforward process if you're supported by the right retailer. Shop around and try out different options and you'll soon find the perfect handbag rental for you.